Star Wars‘ own Abominable Snowman, the Wampa, obviously, is native to Hoth. My guess is that it preys on wild tauntauns and whatever other lifeforms Hoth manages to support. If its approach to Luke is at all typical, it’s an ambush hunter that has the interesting habit of bringing excess food back to a suitable ice cave and hanging it from the roof by freezing its feet into the ice. Also, it’s apparently none too concerned whether its prey is fully dead before dragging it home either. 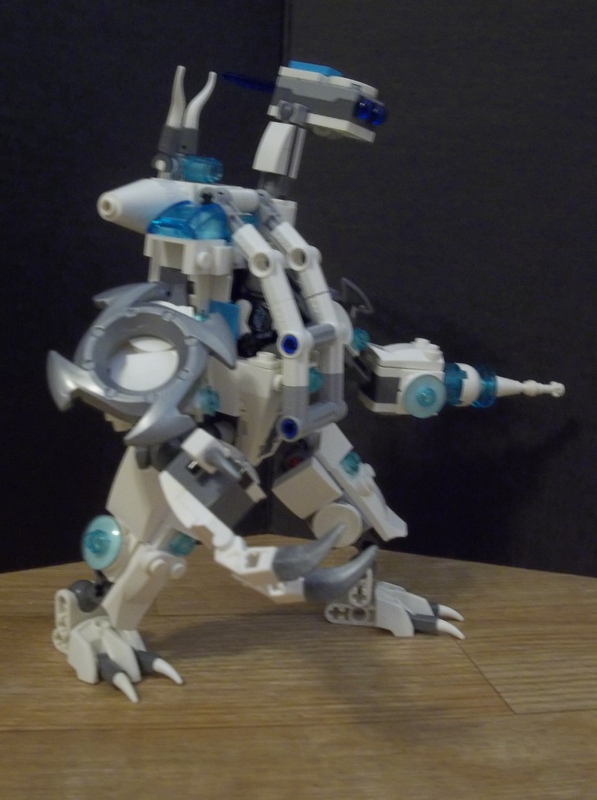 If the legs seem familiar, it’s because I modified them slightly from the ice mech. They seem to work even better here. I think I’m most pleased with the horns. 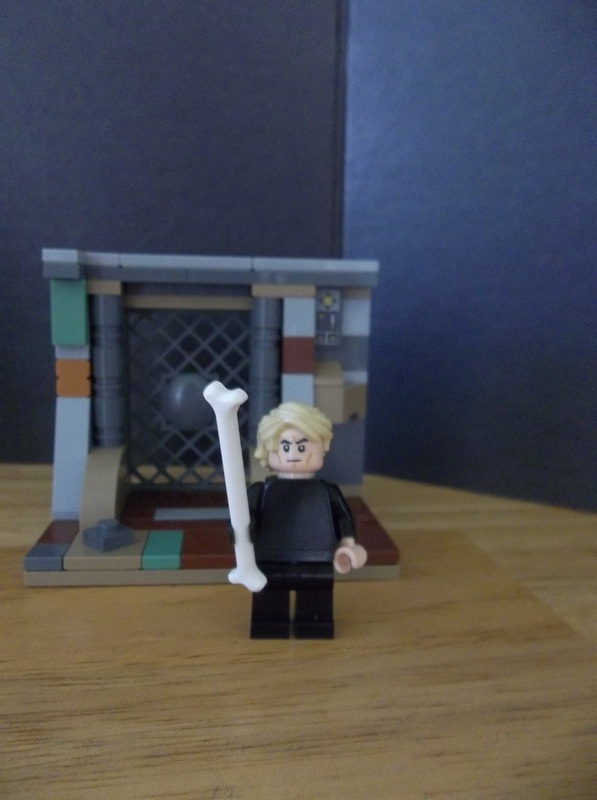 The forward-curving horns of the original are difficult to reproduce well in LEGO bricks, but I’m quite proud of what I’ve managed here. They’re technically coming from a little low on his head, but we ca work with that. Actually building these creatures isn’t easy, you know. I’m not sure if those legs aren’t actually too big and powerful, but you never really get a good profile of the creature in The Empire Strikes Back, so I’m declaring artistic license to interpret it how I like. 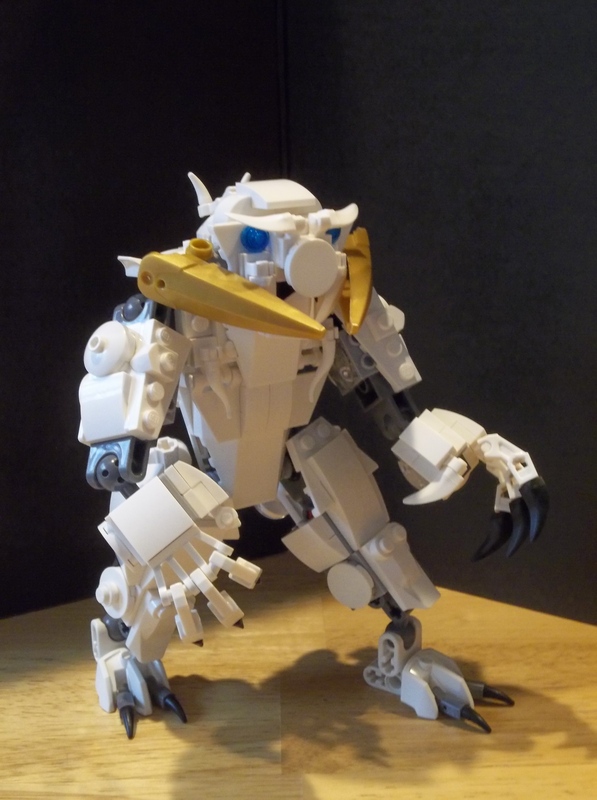 Powerful legs for a short dash or pounce from ambush would fit the Wampa’s shown lifestyle. What with me moaning last time that most Star Wars creatures aren’t all that well-thought-out, the Wampa’s one of the better ones. It actually feels like a real(ish) creature. 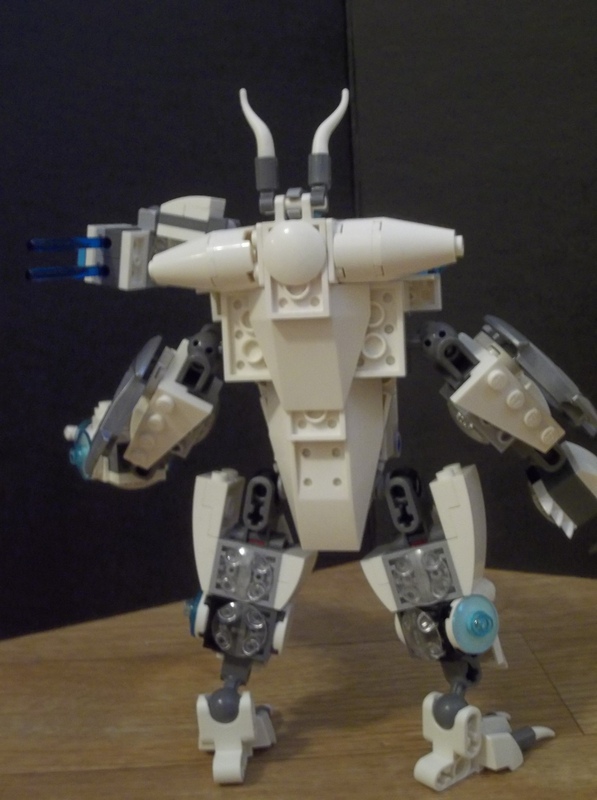 This entry was posted in Creatures, LEGO Star Wars and tagged Hoth, Lego, MOC, The Empire Strikes Back, Wampa on February 27, 2017 by geoffhorswood. As superb as the Star Wars universe is for the designs of its vehicles, characters and sentient races, its alien animals leave something to be desired. The asteroid creature from The Empire Strikes Back is probably the worst offence against reasonable alien biology (it lives in vacuum. Obviously it doesn’t need to breathe. But how does it survive? What does it eat? How does it move from one space rock to the next? And I don’t even want to get started on the improbabilities involved in its finding a mate), but very few of the creatures are all that well-designed. The Rancor’s one of the better ones, if you discount the improbability involved in it acting (and possibly looking) like a troll. 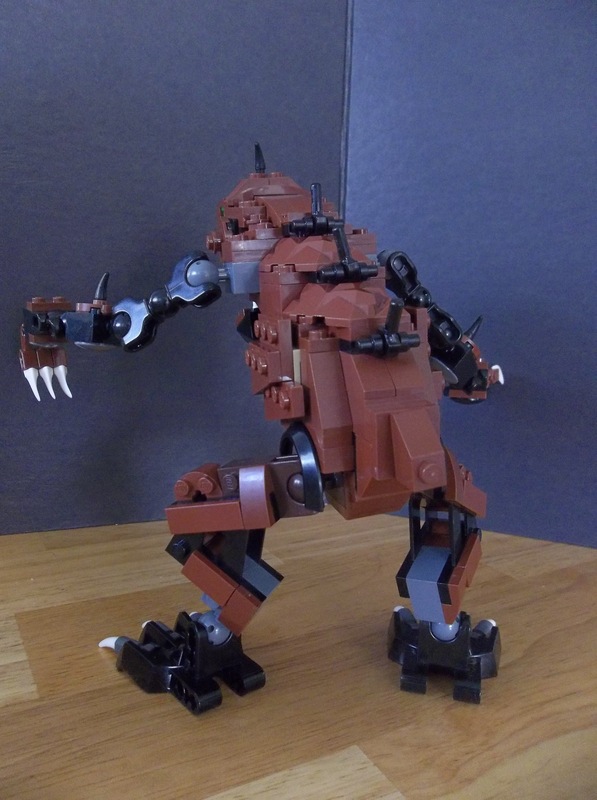 A biped that’s obviously not built for running, like most of the Star Wars bestiary, it’s designed simply to be monstrous. This accounts for almost every one of the Star Wars bestiary, from Naboo’s gargantuan monster sharks to the Dianoga from the waste compactor (which preys on our fear of snakes) to the Acklay (impalement) to the Rathtar (tentacles and bizarrely abnormal motion). 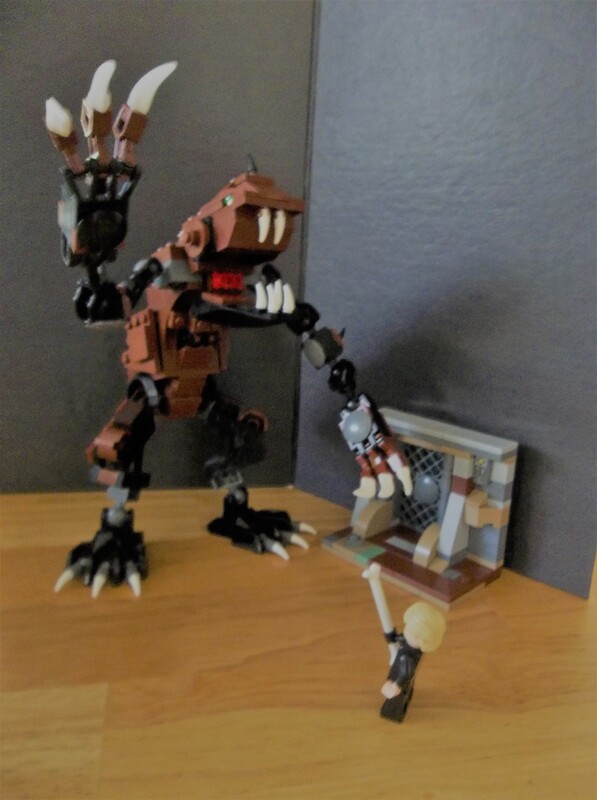 I’m not sure whether my Rancor or LEGO’s own large minifigurelike moulding is a more accurate size representation of the creature that Jabba keeps as an entertaining way to dispose of unwanted guests. But LEGO building is typically a little flexible as far as scale goes. 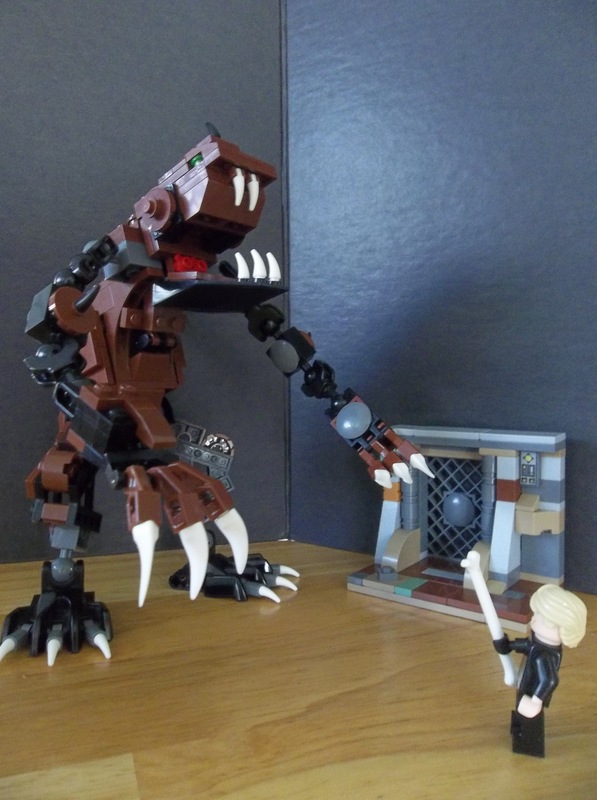 Now, the Rancor is obviously carnivorous, but even though it’s a biped, it doesn’t seem like it’s built to run down its prey. In Return of the Jedi, it lurches around the dungeon slowly; it does not leap or run. This suggests a scavenger, but. A scavenger of that size ought to have no problems with a little bone. Also it’s slow-witted enough not to try to use its hand claws to dislodge the bone from its mouth, and most scavengers are fairly smart (look at rats). Of course, its hands are huge compared to its mouth, but the fact that it has gasping hands at all suggests a level of intelligence that it doesn’t actually seem to display all that much. On the other hand, though, devouring surprised victims in an enclosed space doesn’t take a lot of brainpower. I suppose, too, it’s possible that this is a lamed or crippled specimen. It seems to have enough predatory instinct to kill, which suggests a hunter rather than a scavenger, but its slow forward speed combining with arms definitely designed to grasp and hold throw interesting light on its potential wild lifestyle. If it’s a lamed example, though, that makes more sense. As a pit beast in Jabba’s palace, it doesn’t need to move fast; perhaps it was intentionally lamed to prevent its escape. It could also be a specially-developed animal specifically created to serve as a gladiatorial opponent. Star Wars’ biotechnology doesn’t seem as advanced as all that (you get the impression that Kamino’s cloners are unusual), but if the technology exists, the Star Wars galaxy is the sort of place where it’s going to happen. 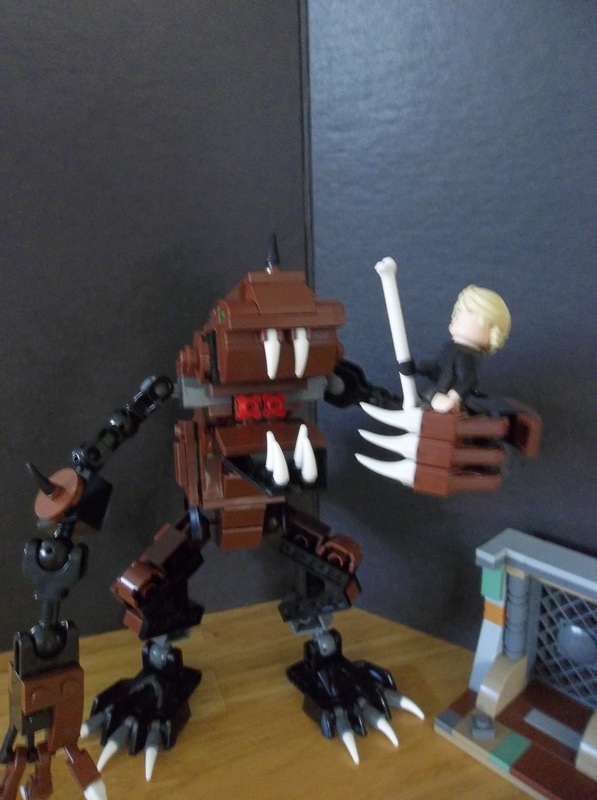 Anyway, here’s my version of the Rancor, complete with a pseudo-Luke Skywalker for it to attempt to devour. Lloyd’s hair isn’t quite right for Luke’s, but in some ways it actually seems closer to Mark Hamill’s actual haircut than TLG’s. Go figure. Anyway, here he is. I hope Malakili would approve. 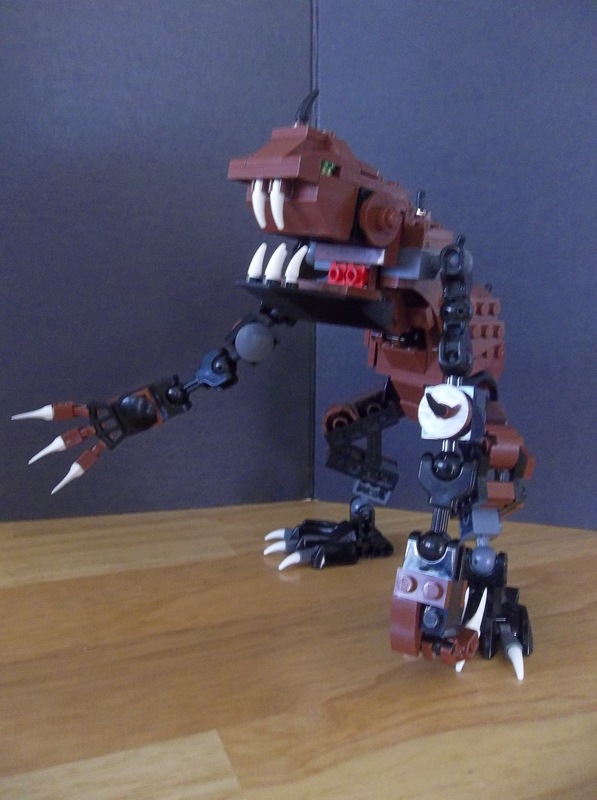 This entry was posted in LEGO Star Wars and tagged Beast, Lego, MOC, Rancor, Return of the Jedi, Star Wars on February 24, 2017 by geoffhorswood. 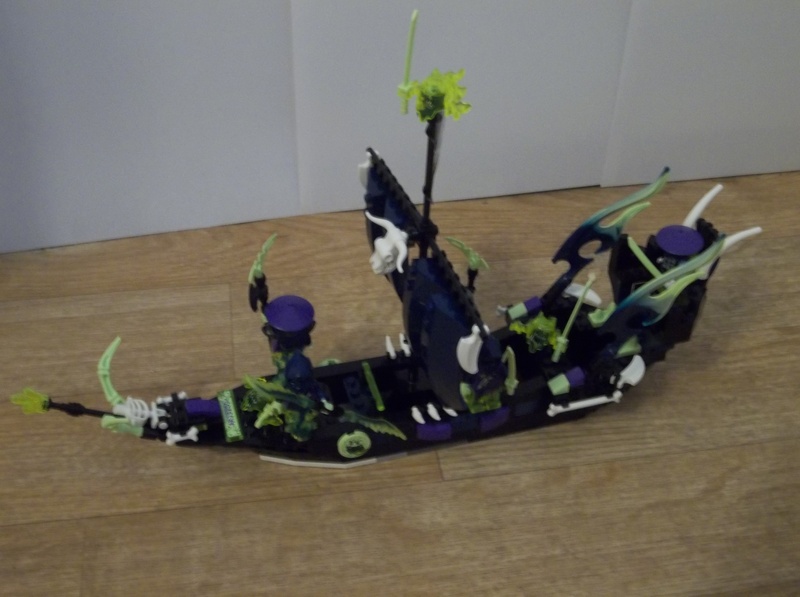 Well, my son made the reasonable assumption that my ghost ship (last time) was indeed a Ninjago ghost ship. 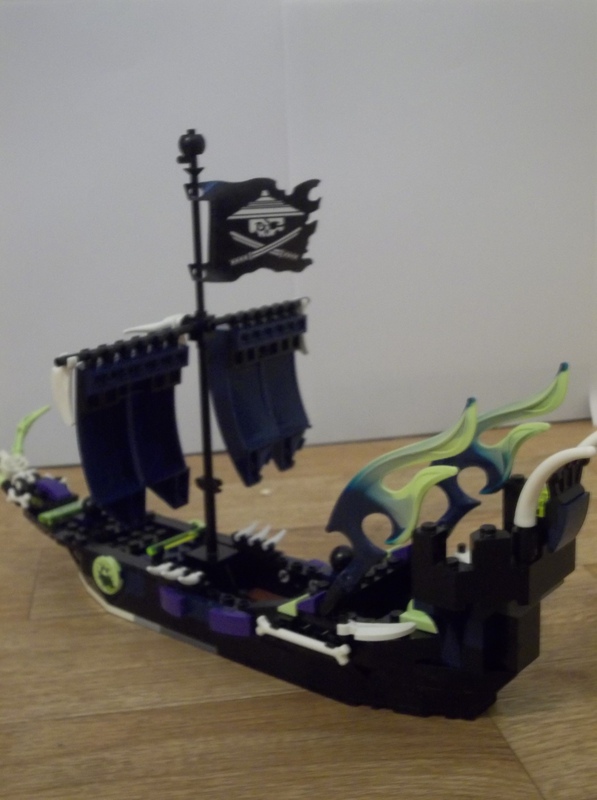 “Can we build a Ninja ship too?”, he asked. 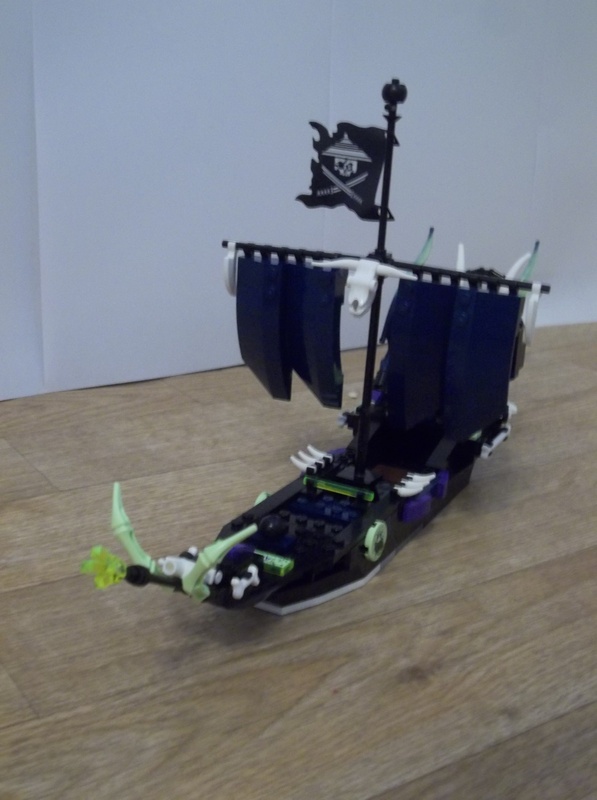 So I built a sort of diminutive version of the Destiny’s Bounty, but it’s not really good enough to show. 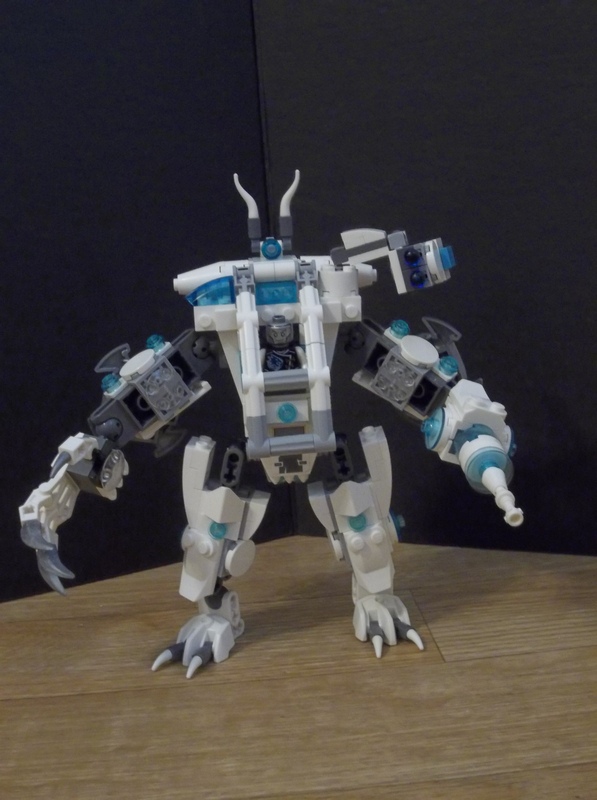 This ice mech, however, I’m sufficiently pleased with to publicise. 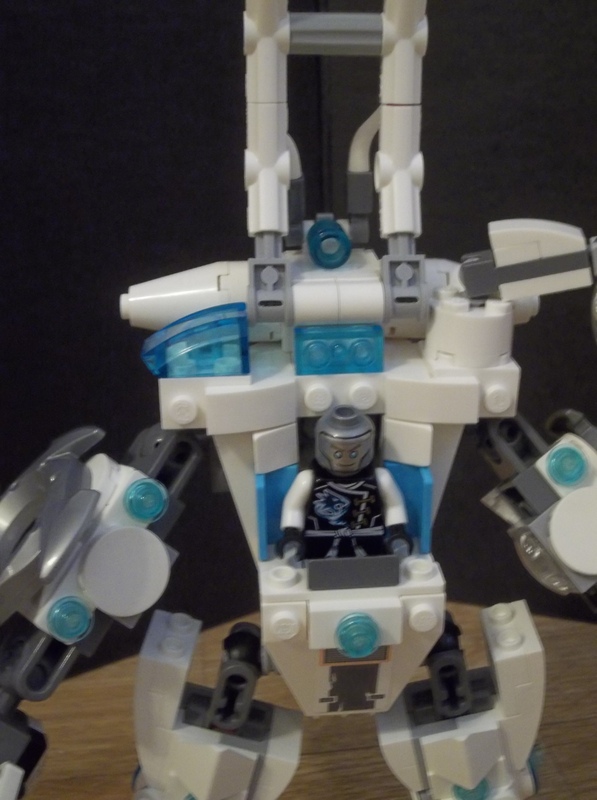 Zane’s turned up again since I built the white dragon, but sans his ninja mask, which appears to be permanently missing. 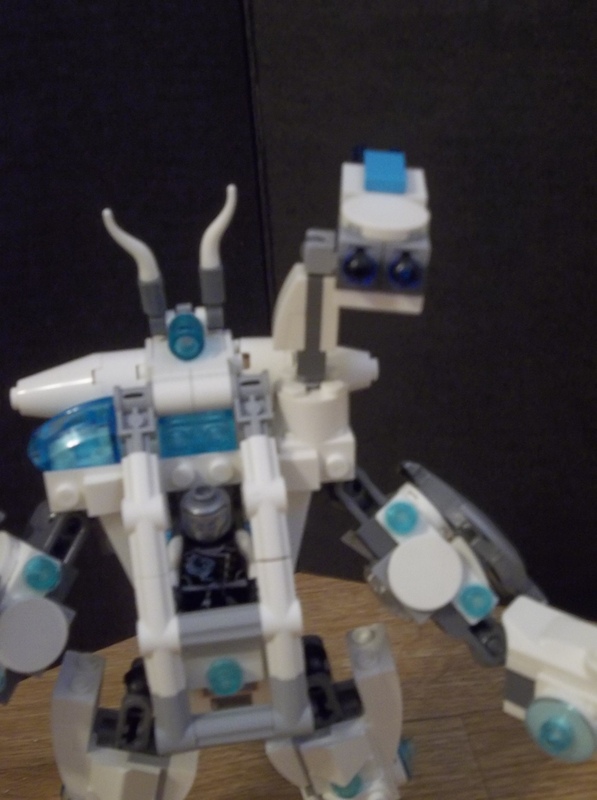 I’ve ordered a replacement from Bricklink now (for my son’s upcoming 6th birthday next month), so I’ll probably find it some time in the next two or three weeks :P.
Anyway, this is an ice mech for the titanium Ice Ninja to drive. 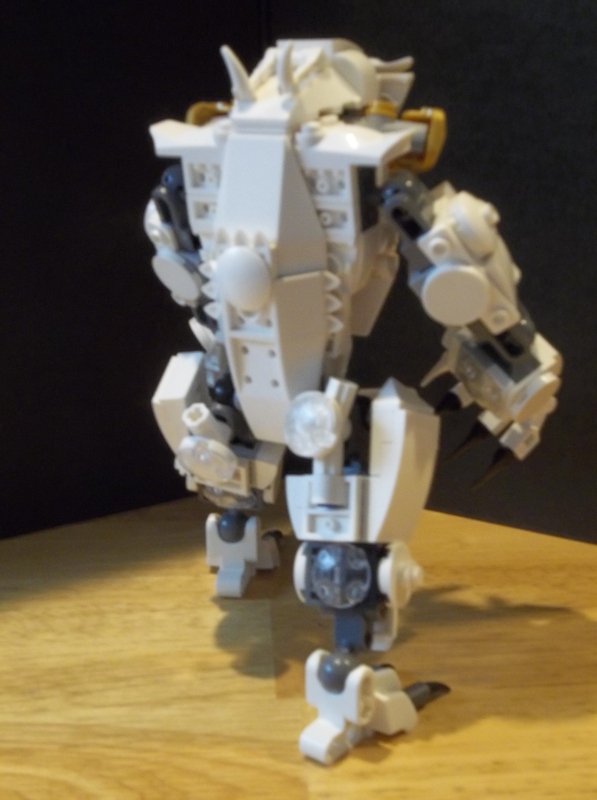 It’s a while since I’ve buuilt a proper mech, and I’m quite pleased with the semiorganic look of the legs and arms. Apparently dragonbuilding pays off in mech limb construction technique. The framed rollbar cockpit canopy is a new departure for my mechs, but I’m mostly pleased with it. 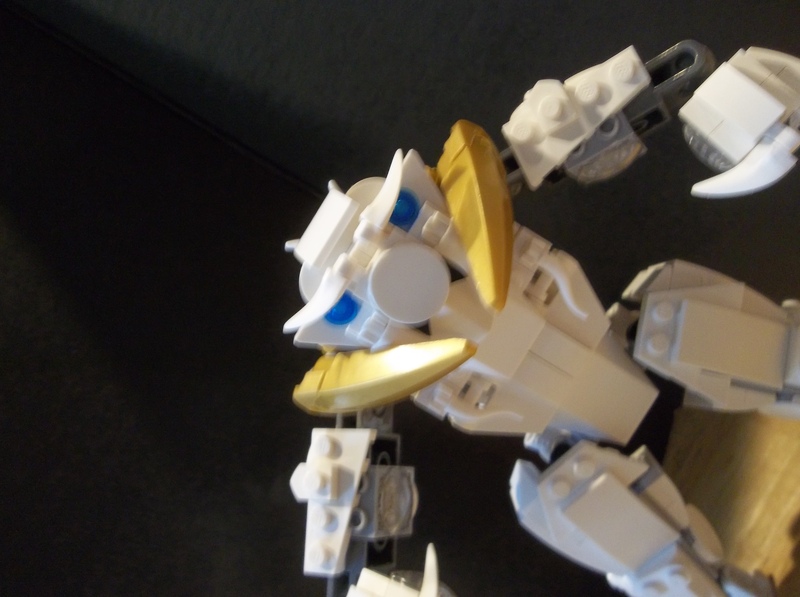 I think all white would have been better, but Saurian’s First Rule states that “You Use What You Have”. 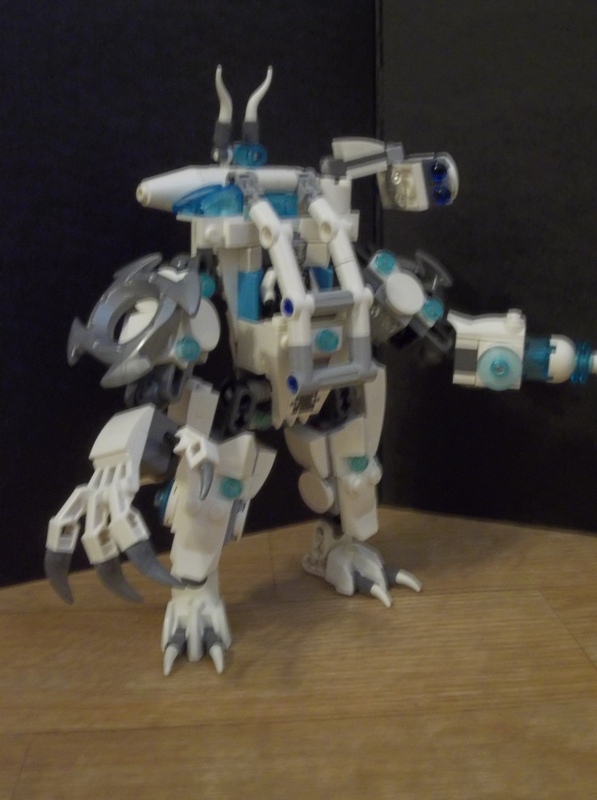 That was what was available, and it still fits the basic colour scheme as per Saurian’s Third Rule. 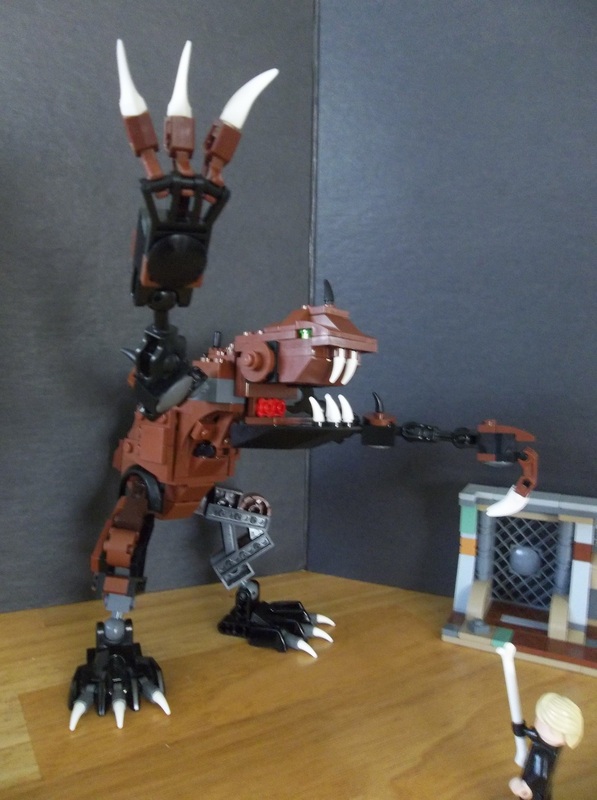 My son added a sword to the claw hand, but it’s gold, which breaks the Third Rule (“Being OCD About Brick Colour Is Always Worthwhile”). 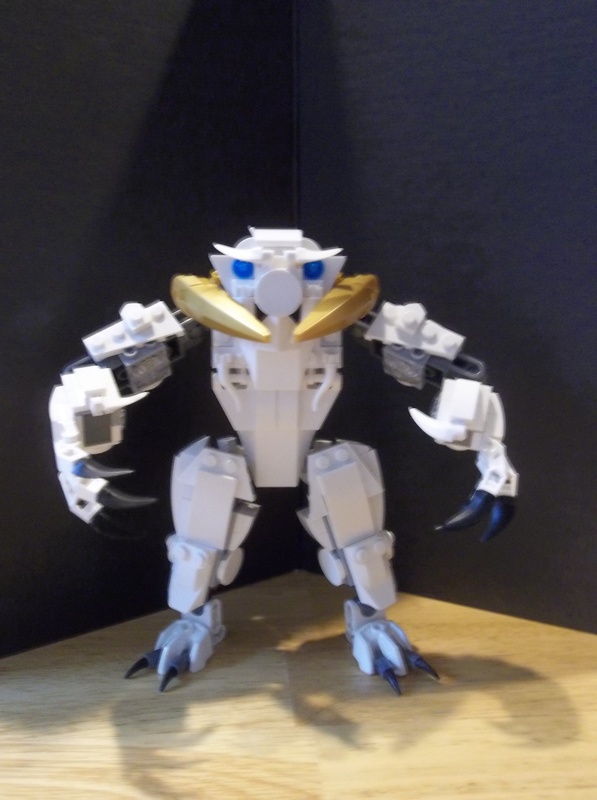 So here’s the mech without it. 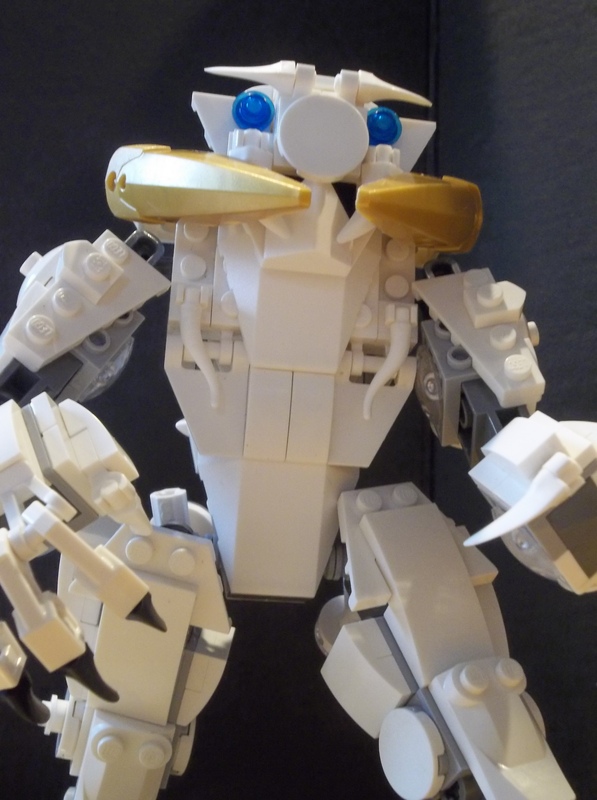 This entry was posted in Mechs and tagged Ice Mech, Lego, MOC, Ninjago on February 21, 2017 by geoffhorswood. Ghosts… ghosts everywhere. What can I do with all these ghosts? 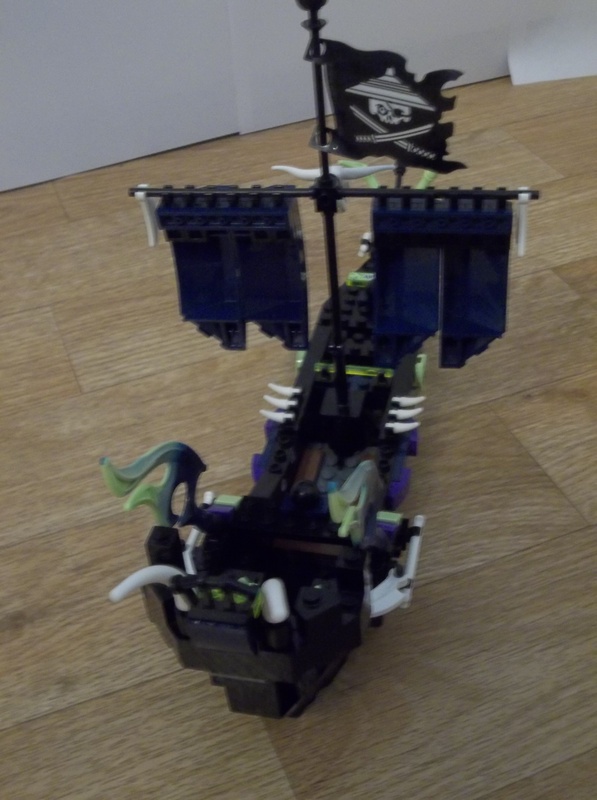 I’m not really into ghosts per se, but with my kids’ love of Ninjago (and my own liking for the sets as cost-effective MOCfodder) we’ve managed to acquire quite a number of the blasted things. 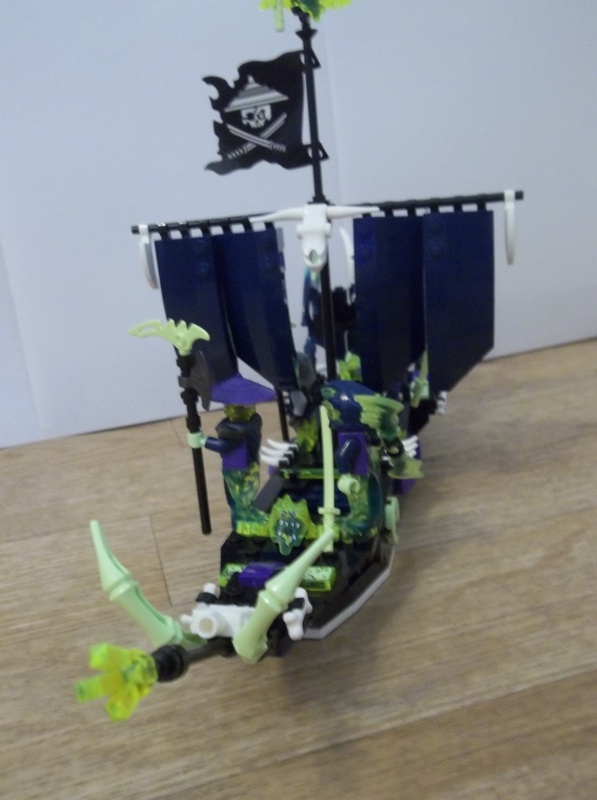 As ghosts go, they’re well-designed, I suppose, with the trans neon green and glow-in-the-dark elements combining well with the blacks and dark blues and purples, but spooky and eldritch aren’t really my thing as building goes. Still, there’s got to be something I could do with these things. The words “ghost ship” floated through the aether like an unquiet spirit, looking for a place to lodge. 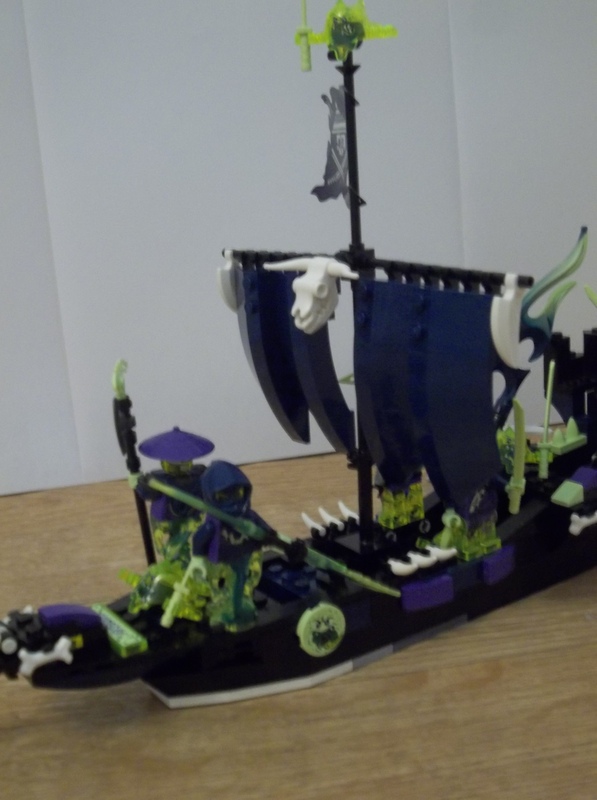 A ghost ship doesn’t have to have anything to do with Ninjago’s ghosts or the Cursed Realm. There are plenty of maritime tales of ghost ships encountered in the fog or by night, apparently hundreds of years out of time, lost on an endless murky sea… We can do that. 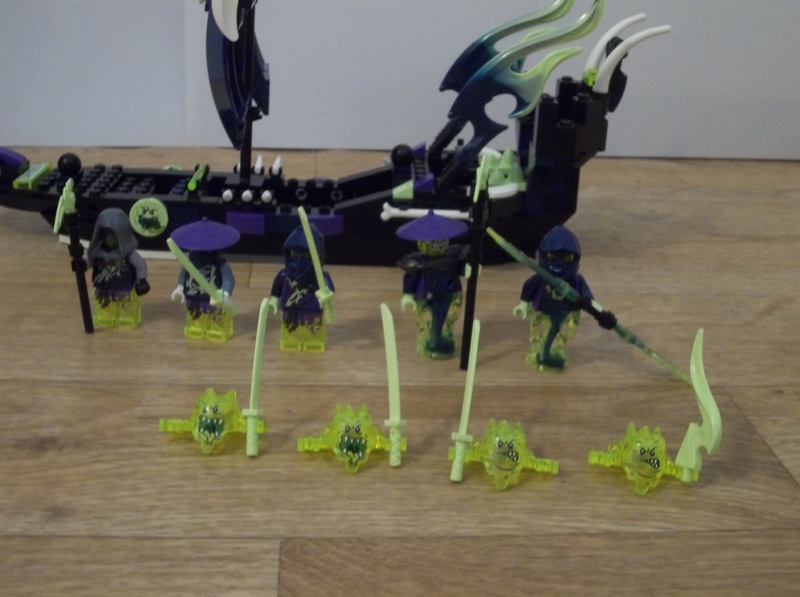 I’ve gone with a Ninjago ghost colour scheme, because the idea was to use all of these wretched ghosts and I wanted them to match. Besides, it’s a nicely dark, ethereal look and works well. 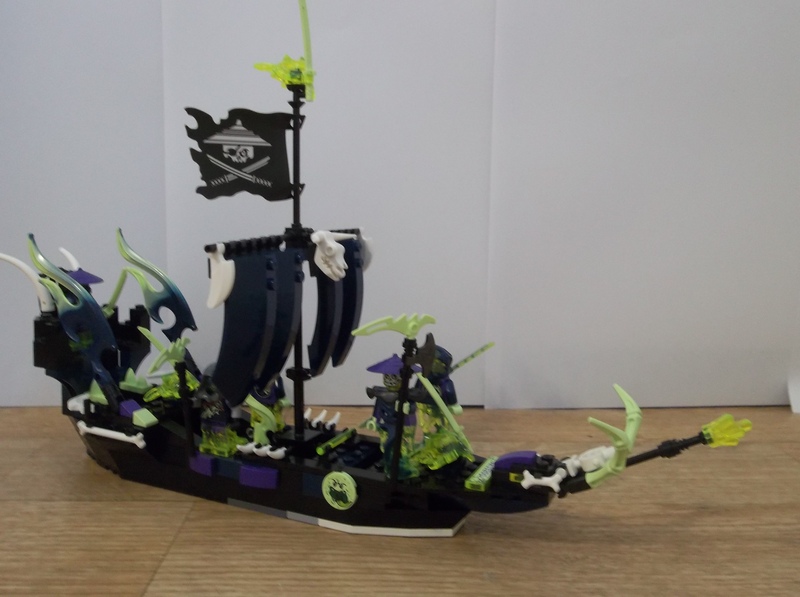 The flag is technically Ninjago Sky Pirates, but it fits the look I wanted better than any other flag I’ve got. 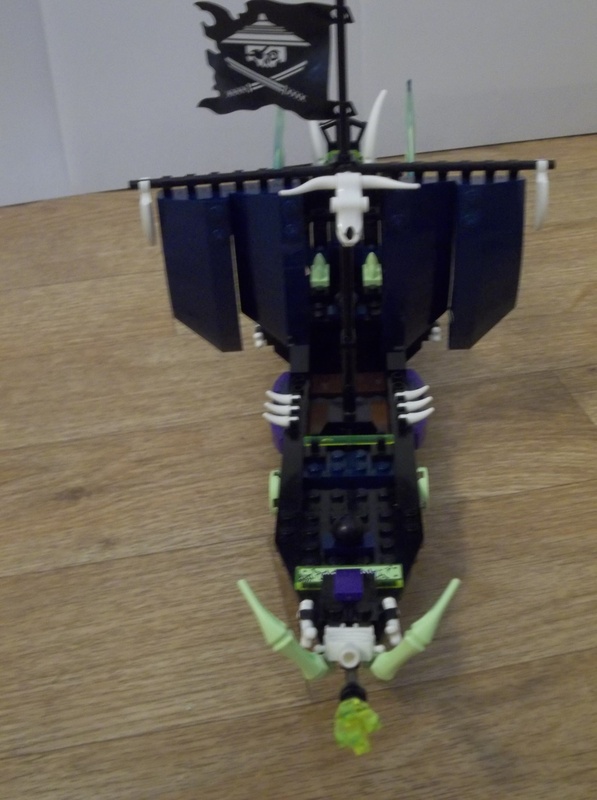 There are white bone elements here and there to add to the postmortem look, and I think one of my favourite parts is the bowsprit area with that jewel up ahead and the glow-in-the-dark skeletal spider legs. My favourite piece of building is the sails. I’ve used some of those 3x8x2 shell elements in dark blue, with clips to attach them to the long rigid hose element serving as the spar. They both fit the colour scheme and look suitably ragged. 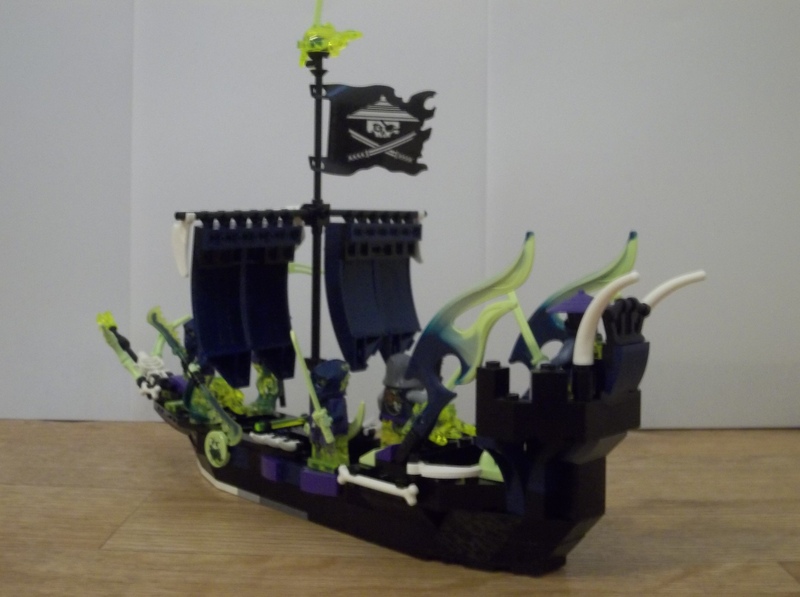 This entry was posted in LEGO Ships, Uncategorized and tagged Ghost Ship, Lego, MOC, Ninjago on February 19, 2017 by geoffhorswood. 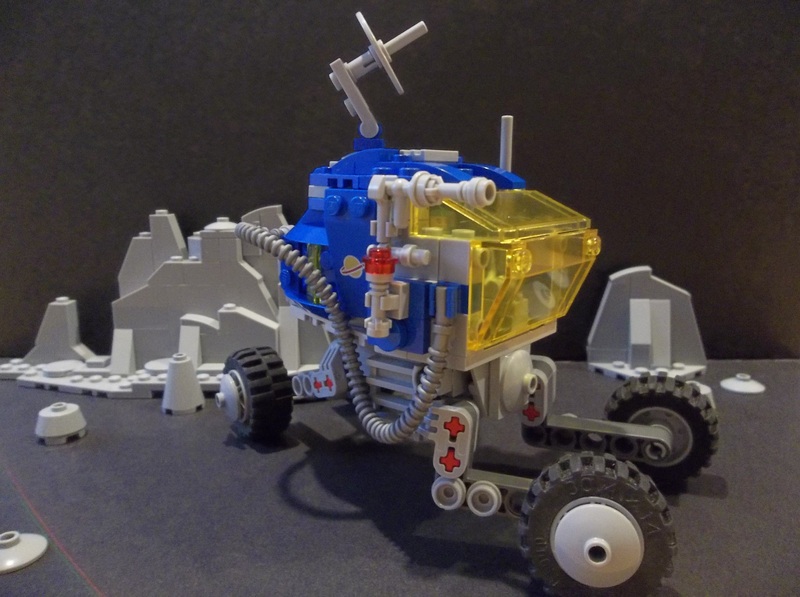 The LR207 Beagle is a long-range exploration rover of the Federation. 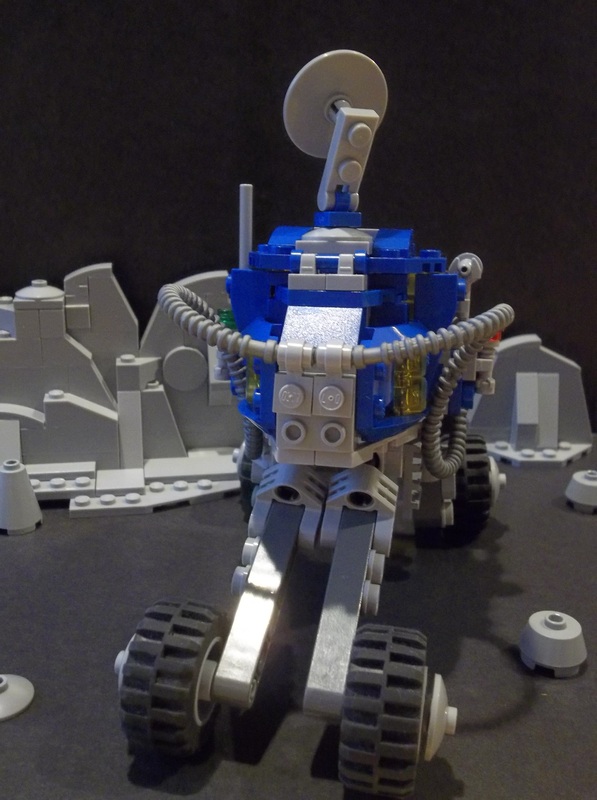 Its long-legged design is unusual as rovers go, but gives the Beagle an agility in rough terrain which is almost unmatched in similarly-sized vehicles. Each wheel strut has independent steerability and suspension, cushioning the ride and enabling the vehicle to be used in even the most rugged environments, those that are more usually mech territory. 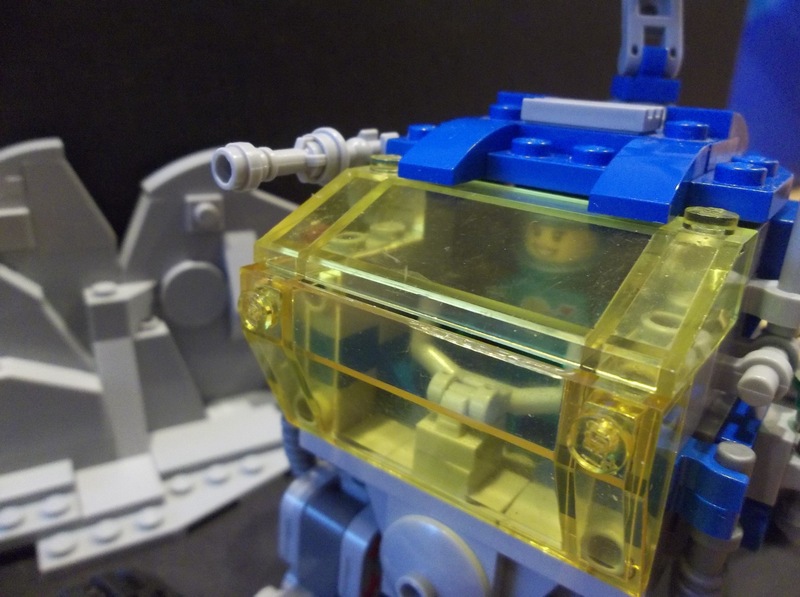 The central cockpit can support a single astronaut in comfort for an extended reconnaissance mission; the side-mounted communications antenna allows the crewmember to remain in contact with Headquarters at all times. The roof-mounted dish antenna is a radar unit with multiple modes that can be used for topographical survey and skywatching (eg for meteor activity). The onboard computer support can even allow the antenna to be remounted beneath the central hull and used as ground-penetrating radar. On the other side of the cockpit from the communications antenna is a small laser which has multiple applications as a tool and weapon. The laser features multiple beam and aperture settings and can be dialed up or down from a 0.5mm low-power pulsed lidar rangefinder to a 1cm high-powered beam weapon. It also has settings that are optimal for rock sampling, in-field laser chromatography analysis and direct-beam communications. February in some LEGO-building circles is “Febrovery”, one of the most egregious examples of name-stretching I’ve seen yet. 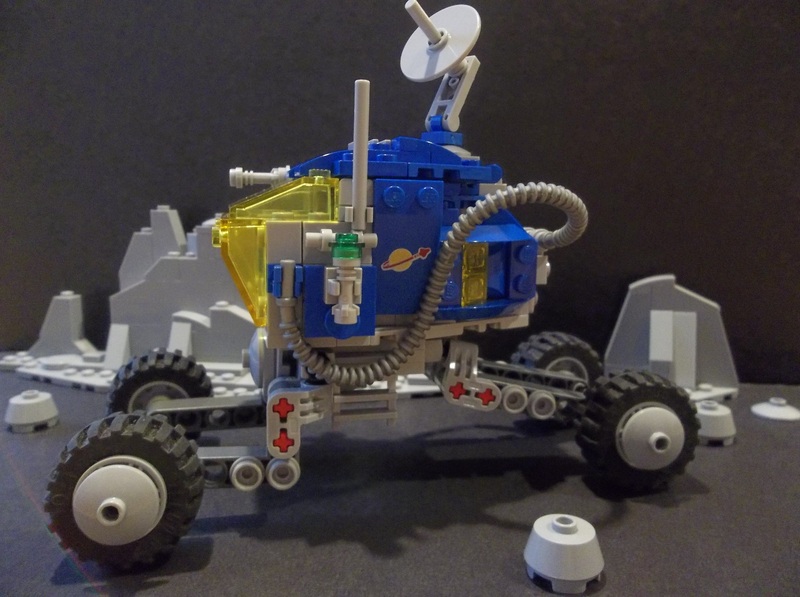 Still, it’s an excuse to build a space rover, something I haven’t done in a while. 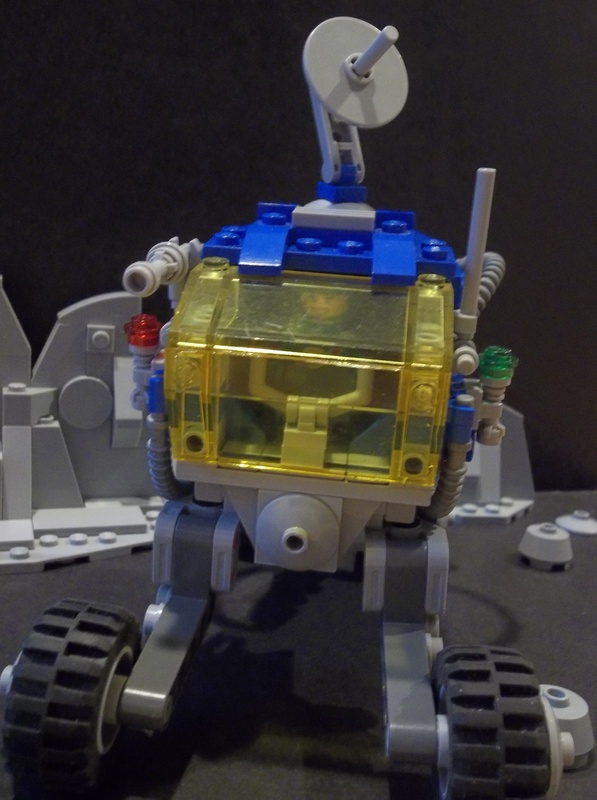 Of course, my rover is a Neoclassic Space rover, because some things are inevitable. Technically the wheel hubs should be red. It’s traditional, based on the fact that when Classic Space was a thing, wheels only came in a red-hubbed variety. But I don’t have any red 2×2 dish elements, so they’re grey. Some day soon I’ll let myself afford another Bricklink spree. 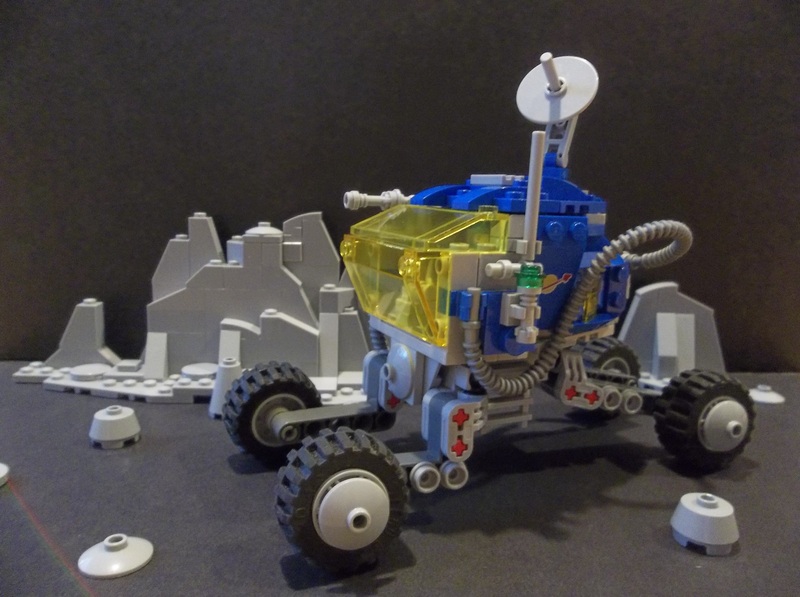 This entry was posted in Lego Classic Space, Lego Space and tagged Classic Space, Febrovery, Lego, MOC, Rover, Space Rover on February 14, 2017 by geoffhorswood.